Before the UW can embark on its master plan for the next 10 years and beyond, the university must gain approval from the City Council, whose members are hearing concerns about traffic, affordable-housing and more from neighborhood associations, nonprofits and unions. 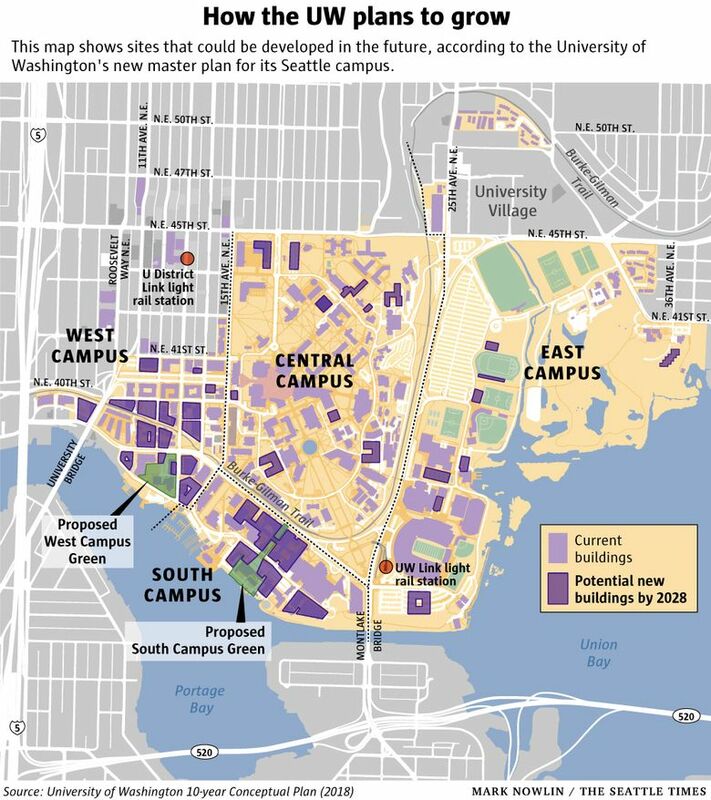 The University of Washington has drawn up a plan for massive growth on its Seattle campus, adding several thousand students, several thousand employees and a stunning 6 million square feet of academic, athletic, research and office space — including 3 million square feet in a so-called “innovation district” characterized by high-rises. • Enrollment would be expected to grow by 11 percent, from 47,219 full-time equivalent students in 2018 to 52,399 in 2028. • Faculty and staff would be expected to gr0w by 11 percent, from 25,304 full-time equivalent employees in 2018 to to 28,080 in 2028. • Square footage of academic, research and office buildings would increase from about 16.6 million square feet to about 22.6 million square feet. • West Campus would accommodate 3 million square feet in growth, half of the growth campus-wide. • Parking stalls would remain capped at 12,300 stalls, excluding stalls associated with residence halls and some other facilities. But before the UW can embark on its master plan for the next 10 years and beyond, the university must gain approval from the City Council, whose members are hearing from neighborhood associations, nonprofits and unions with concerns about the plan amid a citywide population and construction boom. With a council committee set to vote on the plan Wednesday, an umbrella group called the U District Alliance has been warning council members about how the UW’s growth could clog roads, cause pollution and exacerbate Seattle’s housing woes. The Alliance — whose members include the University District Community Council, the local chapter of the Sierra Club and the Martin Luther King County Labor Council — wants the City Council to require that the UW set a stricter car-commuting goal and build hundreds of affordable-housing units for its lower-wage employees. One of Seattle’s largest employers, the UW contends that its car-commuting goal — a 17 percent drive-alone rate by the time light rail opens in the University District, and a 15 percent rate by the time light rail reaches Lynnwood — is adequate to mitigate the consequences of its growth. Furthermore, the UW argues that its plan to build 150 units of housing for lower-income employees is appropriate. 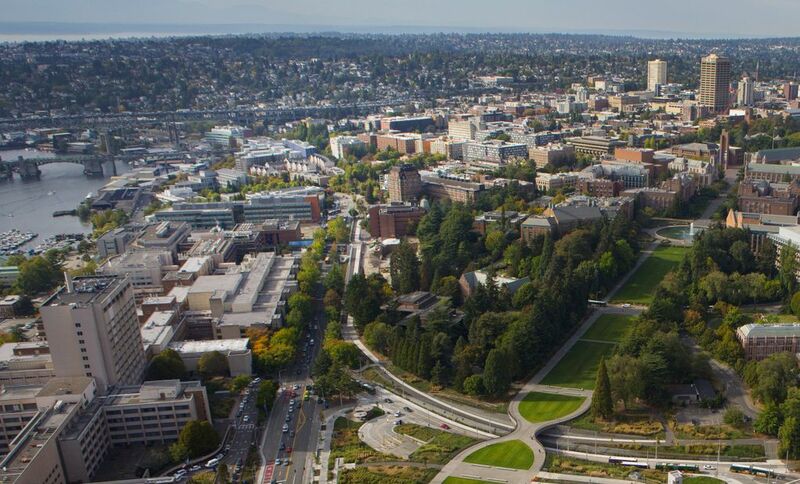 “The UW is a pretty big economic and cultural force in the Seattle area, and to have it be able to grow in a smart and responsible way — which we think this master plan does — is valuable,” said Sally Clark, the university’s director of community relations. Rather than extending the boundaries of its Seattle campus, the UW intends to increase its space from 16.6 million square feet to 22.6 million square feet by building up — on as many as 86 sites. That’s double the construction allowed under the university’s existing master plan, which the city approved in 2003. The new plan calls for half the additional growth to be spread across Central Campus, where Red Square and historic buildings are located, South Campus, around the medical center, and East Campus, where sports complexes and parking lots are located. The other half would occur in West Campus, west of 15th Avenue Northeast. 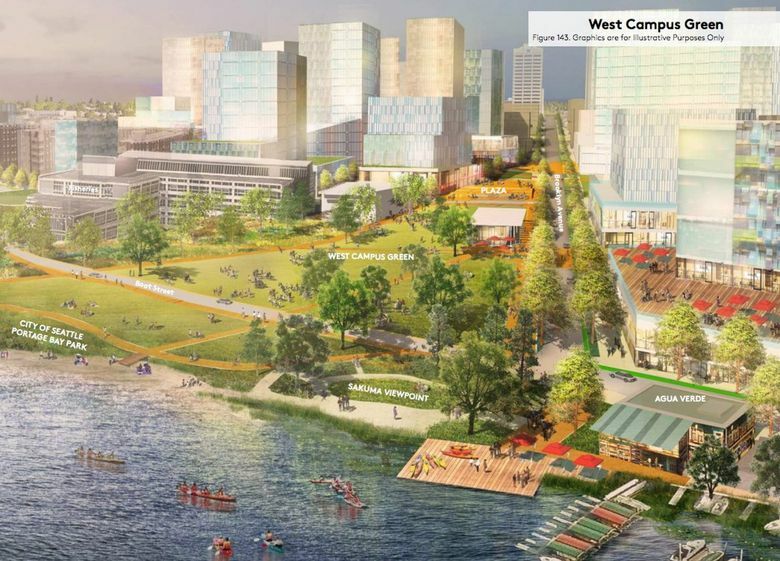 That’s where the UW wants to base the innovation district, where students and researchers would partner with companies, government institutions and nonprofits to start new projects and businesses. To realize that vision, the master plan calls for the city to change the zoning on West Campus and South Campus to allow high-rises, as tall as 17 stories. Maximum heights would increase on some blocks to 240 feet. The rest of the University District was upzoned last year, and the UW is hoping that private development there will complement its own activities. All the new construction, according to the master plan, will allow the UW to accommodate the equivalent of 11 percent more full-time students and the equivalent of 11 percent more full-time employees by 2028, for a total of more than 80,000 people. Dictated by a special City-University Agreement signed in 1998, the approval process for the master plan is long and complicated. Last year, the UW completed an environmental review and a community-advisory group issued recommendations. Then the Seattle Department of Construction and Inspections reviewed the plan, as did the Seattle Hearing Examiner. Following preliminary approval by the City Council, with conditions, the UW’s Board of Regents and other parties would get to weigh in. The plan would then return to the council for final approval. The city estimates that the university’s growth plan would eventually result in more than 17,500 additional daily trips to campus. The goal of the UW’s existing master plan is to have no more than 20 percent of students and employees commute by driving alone. Under its new plan, that would drop to 17 percent in 2021 and 15 percent in 2024, assuming the light-rail stations open on time. Urged on by Alliance members such as the Sierra Club, Councilmember Mike O’Brien has drafted an amendment that would push the goal down to 12 percent by 2028, with interim goals linked to the light-rail openings. Only the more ambitious goal, the advocates argue, would adequately mitigate the growth in trips and congestion. Labor unions on campus — such as Service Employees International Union (SEIU) Local 925, which represents about 7,000 clerical, administrative and other workers — have supported the 12 percent goal partly because it would push the UW to boost transit subsidies for staff and faculty members. The UW now charges students $84 per quarter for a transit pass, while charging employees $150 per quarter. The university’s drive-alone rate for students already has sunk below 6 percent, while the rate for employees remains above 30 percent. Other major employers in the area, such as the city, King County and Microsoft, offer fully subsidized transit passes, the advocates note. Separate from the master-plan process, transit benefits are part of ongoing contract negotiations between the UW and various campus unions, and university officials have promised to ask the state Legislature next year for more transit-subsidy money. Under the UW’s new plan, the equivalent of more than 5,000 additional full-time students and nearly 2,800 additional full-time employees would need to live relatively close by. The university intends to house an additional 1,000 students on campus by 2028 and to build housing for 150 employees, leaving the remainder to rely on the private market. 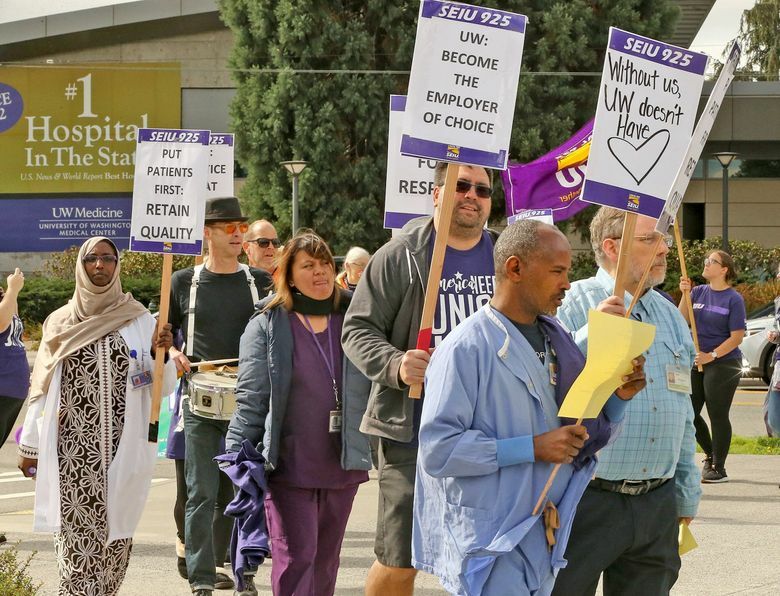 More must be done, the Alliance contends, partly because many UW employees earn modest wages. In 2015, according to the Alliance, the median annual wage was $63,876 for non-academic employees paid monthly. Already, many existing employees must live far from the Seattle campus in order to afford housing. Though light rail will soon better connect the UW with cheaper areas, such as Rainier Valley, new employees who move there could displace existing residents, an Alliance member said at a public hearing in July. The university’s environmental review “failed to examine what would happen to housing affordability” in such areas, said Bereket Kiros, president of the Seattle-based Coalition of Immigrants, Refugees and Communities of Color. The university says its 150 units are enough and that the city lacks the authority to impose housing requirements on the UW, anyway. Were the UW forced to provide more housing, the money would have to come from somewhere, said Clark, a former City Council member. Unlike corporate behemoths such as Amazon, the university relies on state taxes, student and patient payments and grants, she noted. “I get the idea, but is the UW your best target?” Clark asked advocates who want employers to help alleviate the city’s housing crunch. Seattle officials believe they do have the authority to require housing from the UW, and O’Brien has drafted an amendment that would demand an additional 300 affordable units. The UW should set an example for other employers, advocates contend. O’Brien, Herbold and Councilmember Rob Johnson, whose land-use committee is considering the UW plan, each declined to comment. The council is treating the plan as a quasi-judicial action, which council members are prohibited from discussing outside official meetings and hearings.